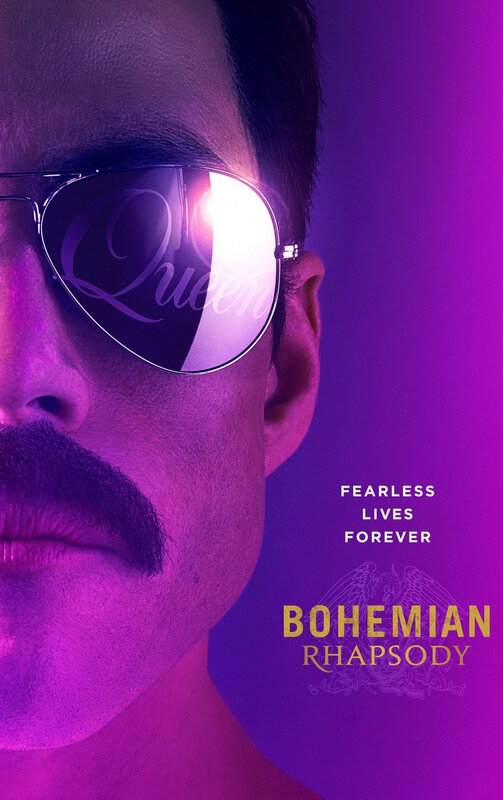 Bohemian Rhapsody is a 2018 biographical film about the British rock band Queen. It follows singer Freddie Mercury's life from his joining the band in 1970 to their Live Aid performance at Wembley Stadium in 1985. A British-American venture, it is produced by 20th Century Fox, New Regency, GK Films, and Queen Films, with Fox serving as distributor. Directed by Bryan Singer, it is written by Anthony McCarten, and produced by Graham King and Queen manager Jim Beach. 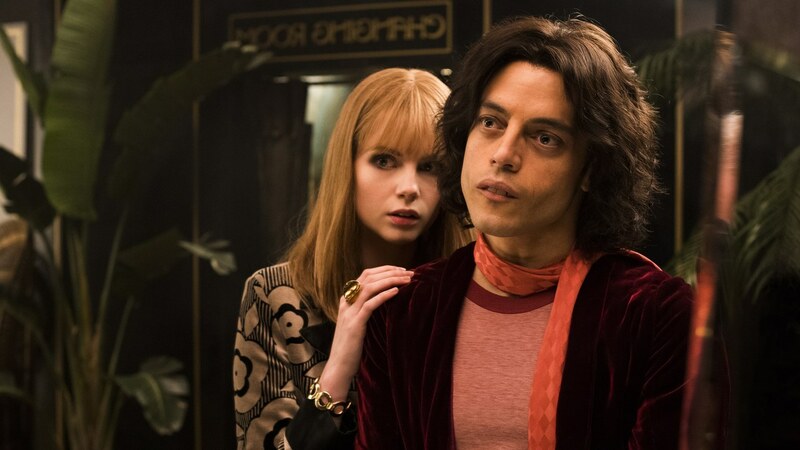 It stars Rami Malek as Mercury, with Lucy Boynton, Gwilym Lee, Ben Hardy, Joe Mazzello, Aidan Gillen, Tom Hollander, Allen Leech, and Mike Myers in supporting roles. Queen members Brian May and Roger Taylor served as creative and musical consultants. The film was released in the United Kingdom on 24 October 2018 and in the United States on 2 November 2018. It received mixed reviews from critics; its portrayals of Mercury's life and sexuality and of the other band members were criticised, but Malek's performance and the music sequences received praise. The film contains a number of historical inaccuracies. It became a major box office success, grossing over $821 million worldwide on a production budget of about $50 million, becoming the seventh-highest-grossing film of 2018 worldwide and setting the all-time box office records for the biopic and drama genres. 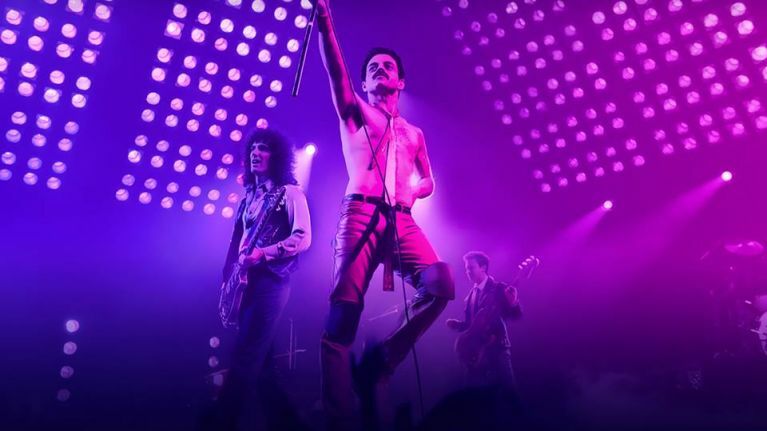 Bohemian Rhapsody received numerous accolades, including five nominations at the 91st Academy Awards, including Best Picture and Best Actor for Malek. The film won Best Motion Picture – Drama at the 76th Golden Globe Awards, and was nominated for the Producers Guild of America Award for Best Theatrical Motion Picture and BAFTA Award for Best British Film. Malek also won the Golden Globe and Screen Actors Guild Award for Best Actor. In 1970, Farrokh Bulsara, an Indian-British Parsi college student and baggage handler at Heathrow Airport, watches a local band who he has been following for a while, named Smile, perform at a nightclub. After the show, he meets Smile guitarist Brian May and drummer Roger Taylor, and offers to replace their singer Tim Staffell, who had just quit earlier that night. With the addition of bassist John Deacon, the band – now known as Queen – play gigs across Britain until they sell their van to produce their debut album. Their musical style lands them a contract with EMI Records. At the same time, Farrokh legally changes his name, now going by Freddie Mercury and becomes engaged to Biba shop assistant Mary Austin. The album hits the charts in America, and, during the band's U.S. tour, Freddie begins questioning his sexuality. In 1975, Queen record their fourth album, A Night at the Opera, but leave EMI when executive Ray Foster refuses to release the six-minute song "Bohemian Rhapsody" as the album's lead single. Freddie has DJ Kenny Everett debut the song on the radio. Despite mixed reviews, "Bohemian Rhapsody" becomes a smash hit. Following a world tour, Freddie begins an affair with Paul Prenter, the band's day-to-day manager. Mary breaks up with Freddie when he comes out to her as bisexual, although she assures him that he is gay. The band's success continues through to the early 1980s, but tensions arise over the direction of their music and changes in Freddie's attitude resulting from his relationship with Paul. In 1980, after a lavish party at his home, Freddie falls for Jim Hutton, a waiter at the party. They soon part ways, with Jim telling Freddie to find him when he learns to like himself. A press conference to promote the 1982 album Hot Space is hijacked by the press, who bombard Freddie with questions about his personal life and sexuality, to which Freddie responds with insults and refusals towards the press. Freddie's relationship with his bandmates sours when he announces that he has signed a $4 million solo deal with CBS Records. He moves to Munich in 1984 to work on his first solo album Mr. Bad Guy and engages in gay orgies with Paul. Mary, now pregnant, visits and urges him to return to the band, as they have been offered a spot in Bob Geldof's benefit concert Live Aid at Wembley Stadium. Discovering that Paul withheld this news from him, an enraged Freddie severs ties with him. In retaliation, Paul goes public about Freddie's sexual escapades. Freddie returns to London to ask for forgiveness from his bandmates and manager Jim Beach. They are reconciled and are given a last-minute slot in Live Aid. 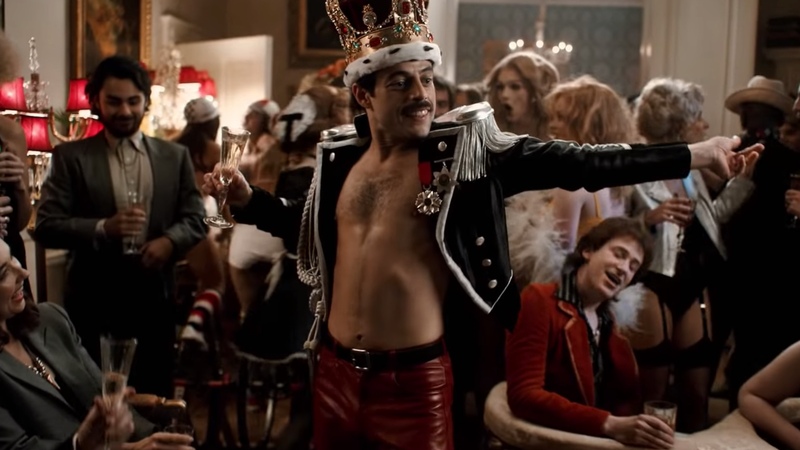 With the outbreak of AIDS spreading worldwide, Freddie discovers that he is infected with the disease. He reveals this to his bandmates during a rehearsal, and they embrace. On the day of Live Aid, he is reunited with Hutton and Mary, and reconnects with his family with his father's Zoroastrian maxim, "Good thoughts, good words, good deeds." The band perform at Live Aid, performing "Bohemian Rhapsody", "Radio Ga Ga", "Hammer to Fall" and "We Are the Champions". The Live Aid set is a massive success, helping increase the rate of donations during the event.